I first met Eben Sadie in 2002, on my initial visit to South Africa’s beautiful Cape region. Prior to the trip, I had heard rumors from my spies about a fascinating new “garage” wine that was going to shake up the South African wine industry. Along with several other tasters from Europe and Australia, I was in Paarl as an international judge for the annual South African wine competition, and I invited Sadie to present his new wine, called Columella, to us at our hotel one evening before we were scheduled to leave for dinner. Sadie was late. We waited for about half an hour, then gave up and assembled in the front hall. That’s when Sadie blew in, a bottle in one hand and a box of glasses in the other. At a table in the foyer, as the mini-buses waited for us in the courtyard, he poured us a taste of his first vintage, the 2000, which had recently been bottled. We were stunned by the complexity and wildness of the wine; it was head and shoulders above 99% of what we had been tasting at our wine competition. It was clear that a star had been born. Cut to 2014. On a clear dry day this past September, at Hearth Restaurant in New York City, Sadie presented what he said was the first vertical tasting of all finished vintages to date of Columella, beginning with the 2000. As I had previously had the chance to taste every vintage but never a large group of vintages on the same table, this extraordinary event proved to me that Columella, which has always been based on Syrah, is one of the half dozen or so most complex, rich and ageworthy collectible red wines made anywhere in the Southern Hemisphere. And Sadie has taken Columella to an even higher level in recent years. Columella was the first outstanding table wine from South Africa’s large Swartland region north of Cape Town. Before launching his venture, Sadie had worked with Charles Back on his Spice Route wines for four years, and in 1998 he decided he wanted to farm his own vines organically. “It was an extreme project from the outset: no spreadsheets,” he said. Sadie went to the sunny, dry Swartland because of what he perceived as the region’s high-quality soils and large stock of old vines, “and because there were no people there.” This very large appellation essentially encompasses three mountains. The Paardeberg, with its decomposed granitic soil, produces what Sadie describes as “brutal, pure” wines with deep tannins, distinctive spicy and herbal qualities, and strong overall structure. The Riebeek features brown, iron-rich slate soil that yields pure red fruit flavors with higher acidity and moderate alcohol levels. 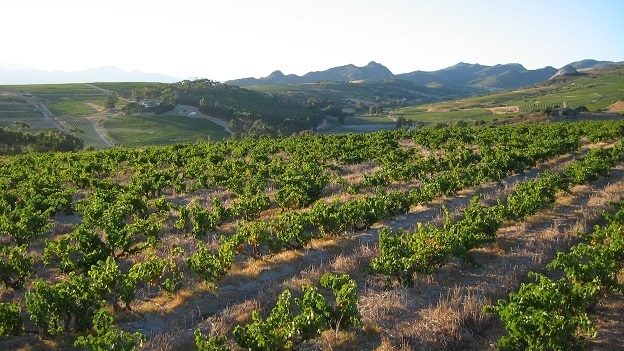 Finally, the less-developed Piketberg, where the vines are still mostly young and are planted on decomposed sandstone, generally produces low-acid wine. This area also brings minerality and salty character as well as deep earthy characteristics. “To make a real Swartland wine, you really must bring in all of the vineyards and regions and varieties,” Sadie maintains, noting that he has worked through the years with eight different distinctive vineyards. Apart from being a wine that can age, Columella is an appellation wine, as Sadie does not believe that any single vineyard or soil type could ever represent the “entire terroir” of the area. Similarly, Columella is a blend of varieties, although it has always been based on at least 70% Syrah. At the outset, some Mourvedre was part of the blend, but since 2008 Sadie has added bits of Carignan (for acidity) and Cinsault (to bring brighter fruit and more freshness). A careful sorting of the fruit at harvest is always done, in most vintages to eliminate overripe grapes in order to avoid a jammy character in the wines. Thanks in large part to the very low cluster weight of Syrah in the Swartland, yields here have been in the minuscule 12 to 22 hectoliters-per-hectare range through the years. Columella, says Sadie, consistently has the lowest residual sugar of any red wine made in South Africa, as well as the highest level of dry extract, which he says is nearly always in the range of 38 to 40 grams per liter. Sadie’s philosophy on grape-growing and winemaking has changed radically since the outset. The new era for Columella really began in 2008, and especially in 2009. “I hit a wall in 2008,” he explained. “I started developing an aversion to oak. Our grapes are too fragile for new oak. Before 2008, I was building the wine,” he explained. “Now my foot is off the gas.” Sadie had previously been aging Columella in 40% to 50% new oak since 2001 but cut that percentage to 10% in 2008 and to as little as 5% (all Taransaud barrels) in some more recent years. He has always preferred using very low-toast oak barrels that have been seasoned for as long as five years. Case production has remained in a fairly narrow range over the years. Four hundred twenty-five cases of the 2000 were produced, while in recent vintages production has been between 750 and 800. The cellar-door price has ranged over that period from ZAR500 to ZAR650 (about $57 at the current exchange rate). Of course, the South African Rand has fluctuated widely over the last 12 years, but Columella has always been expensive by local standards. We tasted the line-up of vintages from oldest to youngest.